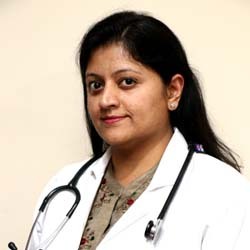 She has done Fellowship in Artificial Reproductive Technique and has avid interest in infertility and fertility enhancing surgeries. She has treated wide spectrum of patents of infertility ranging from ovarian dysfunction, unexplained causes, male factor and female factors. She has special interest in fertility enhancing surgeries like operative Hysteroscopy and Laparoscopy Trainings and conferences Awarded Dr N A Purandare Prize in Mumbai Obstetrics and Gynaecological society Annual Conference, Mumbai Feb 2010. Awarded Dr Subrataa Dawn Best paper award in 11th World Congress & 19th Indian Conference on Reproductive & Child Health NARCHI, Delhi Sep 2012. Dr Neelam Vaid Second prize in theme topic gynecology in the 34th AOGD Conference 2012. Invited faculty in various conferences and authored various scientific papers.